It all began quite innocently, back in George Washington’s day…. In 1800 .001 percent of the population was enrolled in college. By census, 5,308,483 people were living in the United States, of which 893,602 were slaves. Costs were $300 per year for tuition, board, and lodging. Adjusted for inflation, $300 in 1883 equals $6,926 in 2010. Georgetown at the time also had a prepatory school on the grounds. Seniors were able to attend lectures at the Smithsonian when accompanied by a professor. On their days off students could attend debates in Congress or pleadings in the Supreme Court. The school had required religious Catholic worship for students. The tuition for medical school was $100 for the full series of lectures. The college charged $150 for its two-year law school curriculum. By 1900 there were 300 universities. 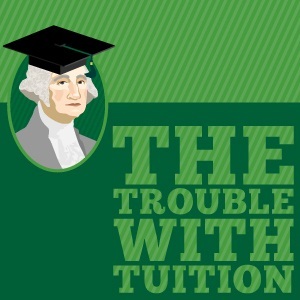 Tuition for private schools averaged $75-$300. TODAY nearly 20 million Americans attend college each year. There are 38.8 million student loan borrowers with outstanding debt. Student debt almost tripled between 2004 and 2012, it now stands at over $1.1 trillion, making student loan debt the largest form of consumer debt outside of mortgages. $101.8 billion: The Department of Education’s estimated profits generated from student borrowers over the last five fiscal years. 17% of student borrowers are 90+ days delinquent, that’s 6.7 million people. Two out of five student loan borrowers — or 41%- are delinquent at some point in the first five years after entering repayment. What’s the R.O.I. of your college degree? Advertising, marketing and promotions: 5.83 years. Marriage and family therapist: 34.67 years. England – As at most English universities, in 2013-14 the tuition fees for UK/EU students studying for an undergraduate degree are 9,000 pounds per year. The average student loan debt for new graduates was 12,850 pounds in the 2007-2008 school year. By 2012, it increased to an estimated 26,000 pounds. Canada – On average, Canadian undergraduate students paid $5,581 in tuition fees in 2012/2013. As of September 2012, the average debt for a Canadian leaving college was $28,000. Canadians have accumulated more than $15 Billion dollars of student loan debt. France – In France, public education is paid for by the state, so tuition at public universities varies from 150 euros ($195.73) to 700 euros ($913.43) depending on the university and level of degree. Private universities in France cost on average, 1,500 – 6,000 euros per year. China – Average tuition in China runs about 40,000 yen ($6517.20) annually. In total, Chinese college graduates owe 8.1 billion yen in loan debts. Sweden – In Sweden, post-secondary education is paid for by the state, so university is entirely free. 85% of all Swedish students graduate with debt. Cost of living combined with large fees cause the majority of Swedish students to accept government sponsored grants and loans. The average student graduates with 124,000 Krona ($19,000) of debt.